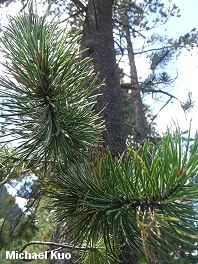 Western pine with short needles in bundles of 2; cones unsymmetrical, under 2 inches, with a long prickle, often remaining closed for years. Note: Described below is Pinus contorta var. latifolia, the Rocky Mountain variety. 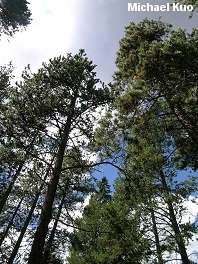 Pinus contorta var. contorta is a stunted but otherwise similar tree of Pacific Coast shorelines; Pinus contorta var. murrayana grows inland from the Pacific Coast, at higher elevations. Habitat: In pure stands or mixed with other trees; 6,000 to 11,000 feet; various soil types. Stature: 70-80 feet high; to 2 feet in diameter; tall and straight, with a narrow crown. Needles: In bundles of 2; 1-3 inches long; yellow-green; often twisted. Bark: Thin; orangish brown to nearly black; scaly. 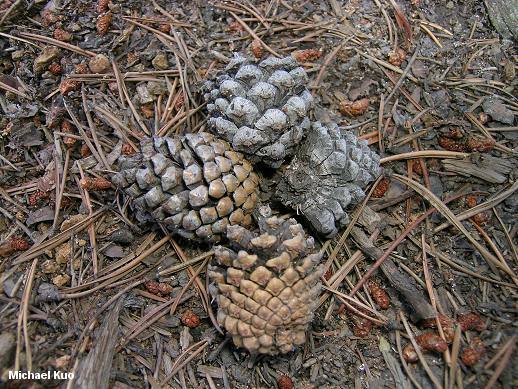 Cones: 1-2 inches long; not symmetrical; scales not developing or separating evenly; basal scales stout, with a long prickle; often remaining closed on the branch for years. Amanita gemmata, Lactarius deliciosus var. areolatus, Suillus brevipes, Suillus tomentosus,and many others.